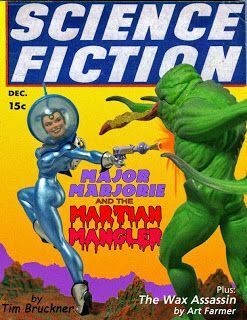 Tim Bruckner's Major Marjorie vs. the Martian Mangler! Two of Tim Bruckner's most space-age sculpts are now together in one deluxe diorama! Major Marjorie and the Martian Mangler have been placed on a single environmental pedestal and hand-painted by Tim himself. Marjorie even comes with a removable helmet accessory! This piece is one-of-a-kind, measuring 16 inches long, 8.5 inches tall and 5.75 inches wide. It's a must-have for fans of old space-age serials, pulp novels and the pin-up art of George Petty.